Jason Bushong has created Graveyard Vineyards’ wonderful wines from the beginning in 2005. While looking for a winemaker, Rob and Paula interviewed Jason, the husband of their boys’ school teacher from Pleasant Valley Elementary School. No question about it, it was a perfect fit. Jason grew up in Riverside and discovered his palate was far different than the other high school seniors when he opened a bottle of Sanford Chardonnay and believed it to taste fantastic. While acquiring his B.S. degree in Psychology from Humboldt State, his drinking preference was always wine. His desire to learn more about Oenology grew and prompted Jason to work with Bob Hodgson at Fieldbrook Winery in Humboldt County, Daryl Mason at Vinatura Winery in Arcata, then becoming the winemaker at the historic Galleano Winery in 1997 while he continued his technical viniculture education at UC Davis. While at Galleano, one of his consultants asked Jason to move to Paso Robles and help build, develop and manage a large wine facility in Paso Robles area with Shandon Valley Partners. This 2.5 million gallon facility was developed from the ground up and Jason’s roll was not only the original winemaker but manager of the facility and developer of all the wine offerings. Due to working in several different AVAs (American Viticulture Area), Jason has a keen sense on how to produce elegant, balanced wines from the variety of soils available. The wines produced at Graveyard Vineyards are focused on being full bodied, approachable and easy drinking. His technical knowledge of winemaking practices and gifted palate have brought Graveyard wines many 90+ point, Platinum, Gold, 4 Star Gold and Chairman Awards. Jason is a family man and when not working on wine, prefers being with his beautiful daughters and wife. Adam is the “Daniel Boone” of the Campbell-Taylor family. Hunting, fishing and anything to do with nature is what he adores. He and his younger brother, Blake, participated in 4-H for many years and learned all the aspects of raising animals the natural and proper way. He continues to raise cattle and poultry on the property. Adam began mowing the vineyards when he was 11 years old and 10 years later continues to learn every aspect of the wine business. You’ll see him all over Graveyard Vineyards since he manages the vineyards, organizes harvest teams, assists Jason, our winemaker, and helps out wherever needed. When he is not here, Adam is attending his college courses in pursuit of an Ag Business degree. Milisa and her husband moved to Paso Robles in 2004 and immediately loved the region and wine produced from the Central Coast. Working in the wine industry for over 10 years, her first wine job was in a nationally known winery where she found her comfort area. Educating wine tasters became her number one priority. Leaving there after becoming Tasting Room & Merchandise Manager, she came to Graveyard Vineyards in 2009 and realized her passion was to provide one-on-one care and attention to the wine club members. At the time she became part of the Graveyard family, there were a mere 250 wine club members. She fondly remembers the days of wine tasting on the front porch of the house and packaging up wine club shipments in the living room. Now with over 2000 Skeleton Key Club Members, an off-site staff of many to fulfill wine club shipments properly, and the passion of individual attention for each wine club member, Milisa thrives on providing excellent customer service and attention to each one. Better known as “Cabernet Frank”, brings his wine knowledge as well as humor into the tasting room. While most people are enjoying their retirement at his age, Cabernet Frank continues to focus on his future in the wine industry. Frank was born and raised in the San Francisco Bay Area in 1934. Being of Italian heritage, he was exposed to wine at an early age and would help his Grandpa make wine in his cellar when he was 5 years old. His earlier working career was as an owner of a printing business and also dabbled in sales in the manufacturing industry. But after retiring in 2003, Frank and his wife moved from Monterey to Paso Robles and decided that the wine industry was his passion and thus began his wine career. Working in various astute wineries in California, Cabernet Frank honed his knowledge of wine and found his way to Graveyard Vineyards in 2011. You will find him in the tasting room Friday through Sunday ready to answer any detailed questions you may have regarding wine and also to ensure you find enjoyment with the Graveyard Vineyards experience. Viviana brings sweetness into the tasting room with her big smile and sincere desire to make each visitor have the most enjoyable time. Born and raised in the small town of Paso Robles, Vivi’s first job in the wine industry started here at Graveyard Vineyards. With her passion to become a Sommelier, you will enjoy her knowledge of wine which continues to grow and her remarkable palate for wine. She loves to share that knowledge with others who visit the tasting room. Darren will make sure your visit with us is a memorable one. 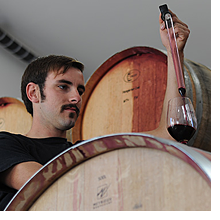 He began with Graveyard Vineyards in 2013 while pursuing his degree in Marine Biology. Once he realized his passion for wine and wine making, he has now changed his degree to winemaking. Darren speaks 4 languages, including sign language, which he uses here in the tasting room with some of our wonderful guests.